Some question my handling of disagreements by jumping in the fire and making attempts at correct communication. This does seem to take us away from our prime directive, but such resolution of conflict is a very important part of the spiritual oneness. When Molecules are in the process of creation, and also after creation, certain egos will fluctuate between focus on the personality and the soul. Two or more people in the soul will always be able to reach agreement. Now I’m talking about important points of direction, not something like a favorite color or movie. No. Not if the agreement is through the soul. Two or more people in the personality can also reach agreement. 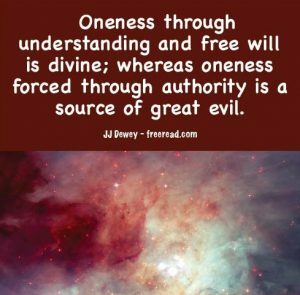 Those who are in group one, as talked about previously, can have the illusion of oneness through the subjection to, not the soul, but an outside authority. For instance those in an authoritative church will rarely go against the authoritative pronouncements of the leaders or established doctrines, or even more subtle directives from the group thoughtform that many will mistake for the voice of God. Those in a political party will often universally submit to party leaders. Those in a certain profession will usually be at one with the leaders of the profession. Individuals may have their own ideas but they will go along to insure their jobs. The interesting thing is that when the personality who has oneness because of subjection to authority steps outside the boundaries of that authority the illusion of oneness evaporates. John and Mary attend the same church and do not question the teachings that come to them from the church. On this they are one because they do not question. Yet when they go home and start talking about how to spend John’s raise in pay all hell breaks loose. Why? Because there is no controlling authority in this department. Two people in the personality consciousness have no problem in agreeing with an outside controlling authority. Their problem of separateness is revealed, however when they work together in a real world situation. When they apply their mindset to their goals on the physical plane they have as much or more friction as anyone else. Now a third combination is that of a personality centered individual and a soul infused individual. You would think that because the soul infused person is a nice guy and sensitive to higher contact that he or she could achieve unity with the personality centered one better than another personality can. Not so. In matters of truth, philosophy and spiritual teachings the two will have more friction than any other combination. In fact he who is centered in the personality will often develop hateful angry feelings toward the one in the soul and be beside himself to explain why. The prime example of this was Jesus. He harmlessly went forth and taught and healed the people. You would think no one would complain about that, but the Jews who were centered in the personality developed tremendous anger and hatred toward Him. It is interesting that when Pilate gave the crowd a chance to release the murderer Barabbas or the kind soul who was Jesus, they chose the murderer by unanimous vote. This is because those whose attention is on the personality are natural enemies of those who are in the soul. As soon as such a one gets a sense of the direction the soul is leading such a person, he will begin to think the soul infused person is an agent of evil that needs to be stopped. Therefore, the one who is in the soul must be as harmless as a dove and wise as a serpent so he does not release too much soul energy too quickly or too soon to those who are resistant to such energy. Yet to those who are seeking the soul the teacher must establish harmony or oneness through conflict if necessary, for oneness must be achieved if true spiritual work is to be accomplished.